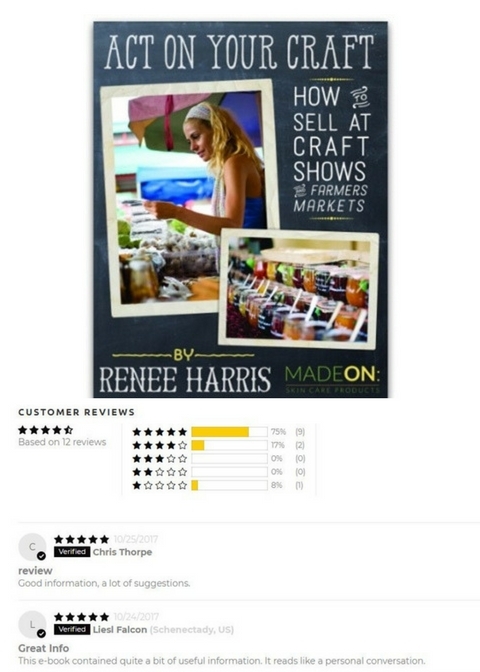 Should you sell your handmade goods at a farmer's market? GET OUR ENTIRE EBOOK COLLECTION FOR $20 BUY NOW. SHOULD YOU SELL AT A FARMER'S MARKET? Kelly: Hi Renee. I have been bouncing back and forth the idea to have a stand at the small local farmers market. Well….to be honest, I just chickened out last year! Renee: Start with your goal. Why do you want to sell at a farmer's market? Kelly: My ultimate goal is for my canned goods to shine brightly and be known as a place - for those that can’t preserve their food - to purchase locally preserved foods. I also think it would be soooo cool to do local demonstrations for those wanting to learn to can. Along with the canned goods I want to have fresh produce that people can purchase. Renee: Would you be able to feasibly start selling soon? And are your goods ready? Kelly: Our farmer's market starts on May 2nd. There isn't much going on right now (the ground is still frozen!) But I have eggs, maple syrup, and baked goodies that I can sell. Renee: I think you should definitely try it out! You'll have to check into your local laws about selling food, though. Just start small - I wouldn't recommend spending a ton of money on your table/booth with decor. If you see it as a chance to try it and see if there's a future there for you, it would be totally worth it. In the beginning, just get as much information as you can from people... find out their preferences, what products they're interested in and why (is it to save time? money? get healthy?). Kelly: I think I have all the décor I would need and tables (thank you, rustic wedding 3 years ago) Gather information, got it! I wouldn’t have thought of that. Cash is the last on my priority list actually, I just want to make enough to cover costs and maybe get a fancy coffee on the way home. Well at least for now. I think it would be SO cool to make this a full-time lifestyle with a full-time income. Kelly: Then it came to me that I could use your lip balm (and maybe lotion?) that I love so much as a filler in these slow times. Renee: Should you sell lip balms? Yes! That might be a good complement to your other products because they're all handcrafted and this could be a "business card" for you... put any valuable information right on the lip balm label (your business name, your name, contact info, email info, etc). Kelly: Great idea on the lip balm labels!! Handcrafted and truly has impacted my life. I am so in love with that lip balm and I want to spread the love. Renee: Do you have family or friends to help out? The ideal is if you have kids who could help you. People love to see families working together, they're cheaper than paying a neighbor to work with you, and they'll learn a lot. Kelly: Everyone tells me that kids sell stuff. (that and the elderly….and of course puppies ha!) I have Uncle Jeff (not family) but a good ole neighbor that has this natural storytelling ability that makes people flock. He said he would come with me for my first time. He has been my support but I think would only come to the first time or second. Kelly: I am so nervous about it and you have been there—done that. I know God has bigger plans for me. I want to give back to the community in the worst way and teach people how to live a simplistic life. Renee: "I want to give back to the community in the worst way" - THIS is a very valuable place to start. With your skills and what you make, you WILL. You will learn so much about the people in your community, and then you'll start recognizing them the next week, until you're on a first name basis. We met so many people and even though it's been over 10 years since I sold at a farmer's market, there are a couple of people I'm still connected with on social media... every now and then I run into someone at the store and we chat. Kelly: Learning about the people in the community is actually the part I am most excited about. I am a big people person and can connect with people well. I can’t wait to impact people’s lives in a good way. Renee: You will! You've got the perfect outlook and totally reasonable expectations. Try it and see if it's something you want to continue with. 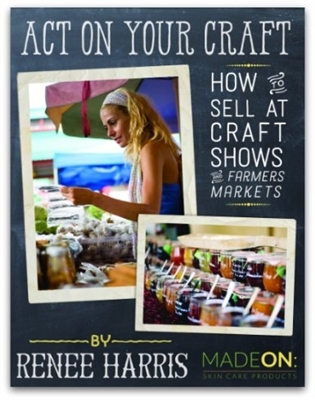 Get prepared to sell at your local farmer's market or craft fair. It is so great that you feel the same way about doing this! I was terrified before I read your book. Thank you so much! MadeOn Skin Care 2018 © Copyright. All right reserved.